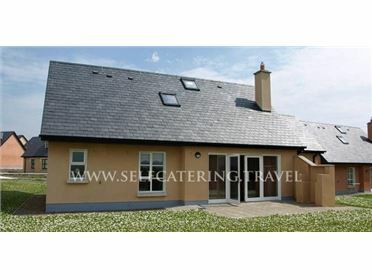 Donour Lodge is a wonderful, semi-detached cottage overlooking the Burren near Fanore in County Clare. The cottage offers seven bedrooms with TVs over the first and second floors, five boasting en-suite shower rooms, including four double rooms, a twin room, a family room with one double and two single beds, and a further double room with an en-suite sauna. There is an open plan living area with a kitchen, a dining area, and a sitting area with a woodburning stove, a second sitting room with an oil stove, and a third sitting room on the third floor. Outside, there is a lawned garden to the front and rear of the property, a side patio with furniture and views of the sea and the Burren, and ample off road parking. Donour Lodge is the perfect base for friends and families exploring County Clare, all year round! Fanore in County Clare is a popular village with walkers, surfers and tourists. Ten miles away is Lisdoonvarna - Ireland's premier Spa town and Doolin is nine miles away.